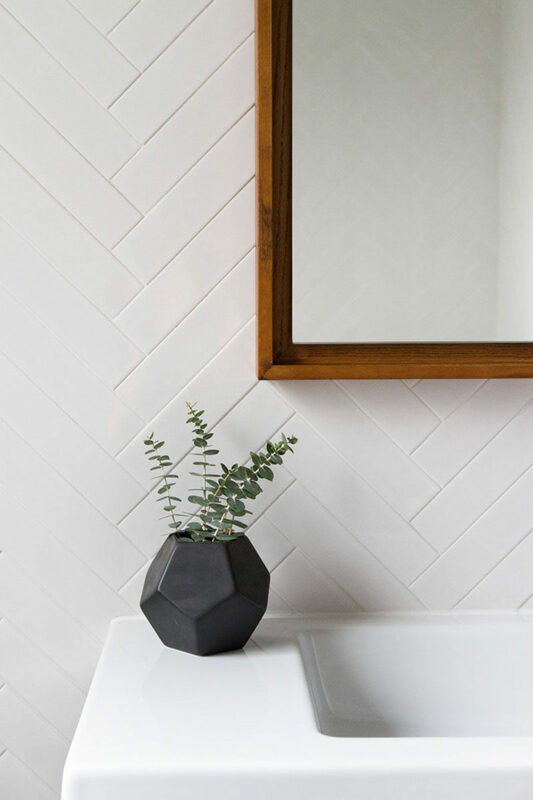 Although men typically don’t spend as much time as women do in the bathroom, it doesn’t mean that the bathroom shouldn’t cater to their design needs as well. Adding a few masculine touches to a bathroom is an easy way to make the space feel more welcoming to the guys who need to use it too! 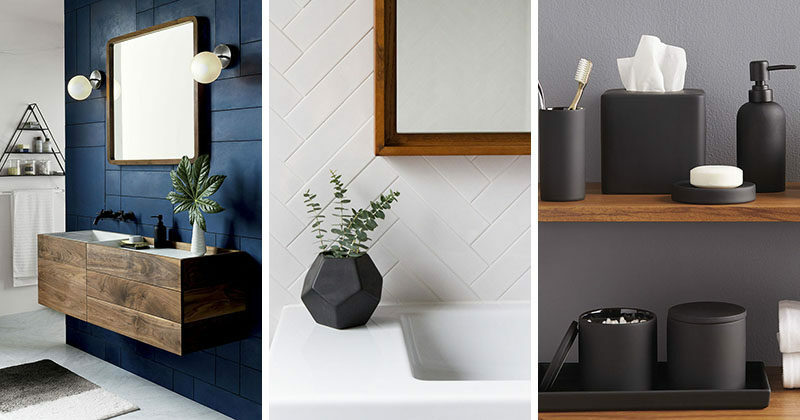 Here are a few ideas for creating a bathroom that will make men want to spend just as much time in there as their female counterparts. 1. 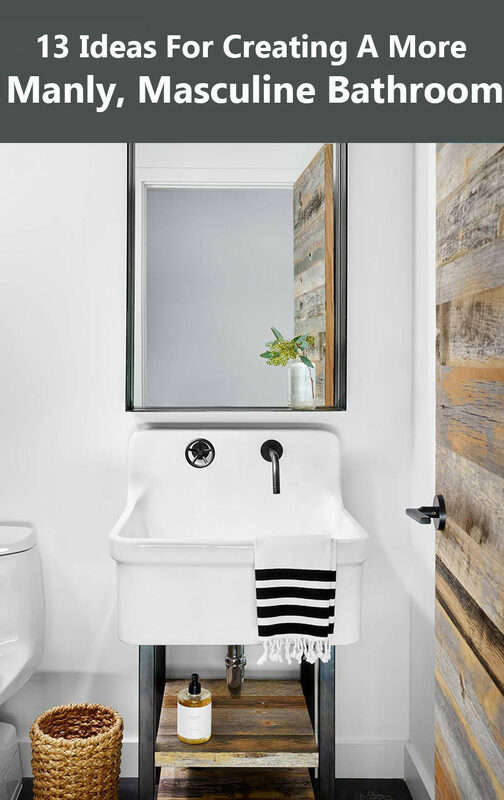 Anything industrial is a good way to make the bathroom more masculine. 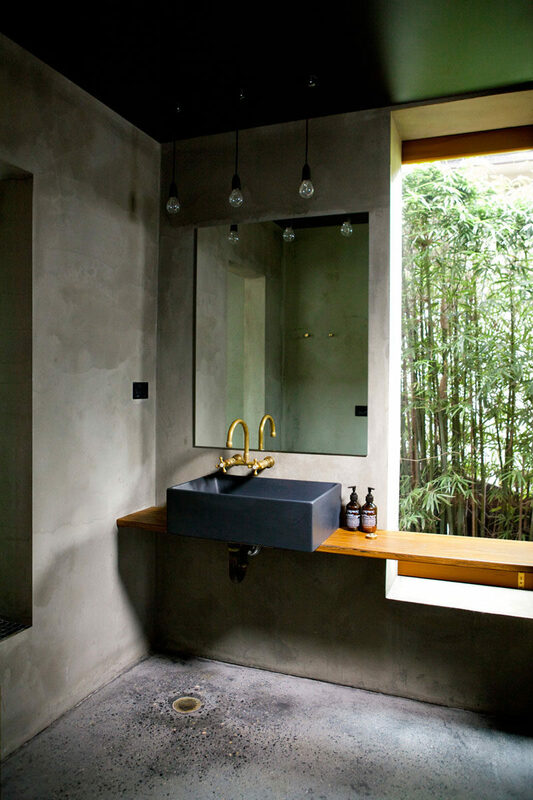 Here, a black sink, concrete walls and floor, and brass fixtures combine to create an industrial and masculine feeling bathroom. George Gorrow House designed by Marika Jarv Creative. Photography by Matt Russell. 2. 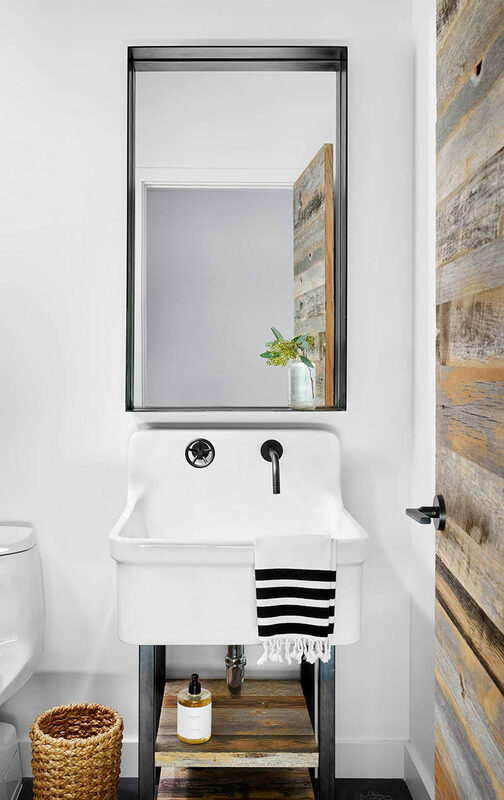 A reclaimed wood door with matching shelves attached to the white sink, give this bathroom a rustic contemporary feeling. Designed by Aamodt/Plumb. Photography by Casey Dunn. See the entire project here. 3. 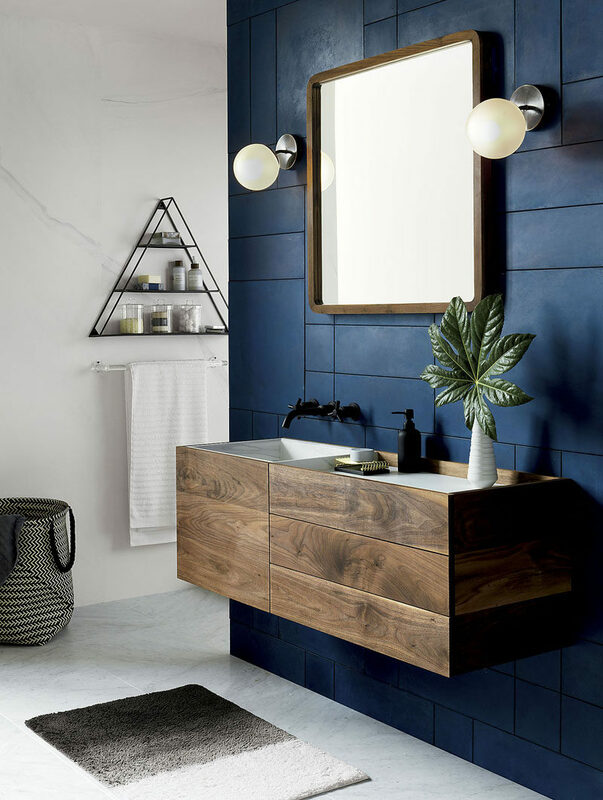 A dark blue accent wall and elements of dark wood and metal add an outdoorsy and masculine feel to this bathroom without making it feel dark or uninviting. 4. A wood bathmat, rather than a fluffy one, adds more of a manly touch to the bathroom. 5. 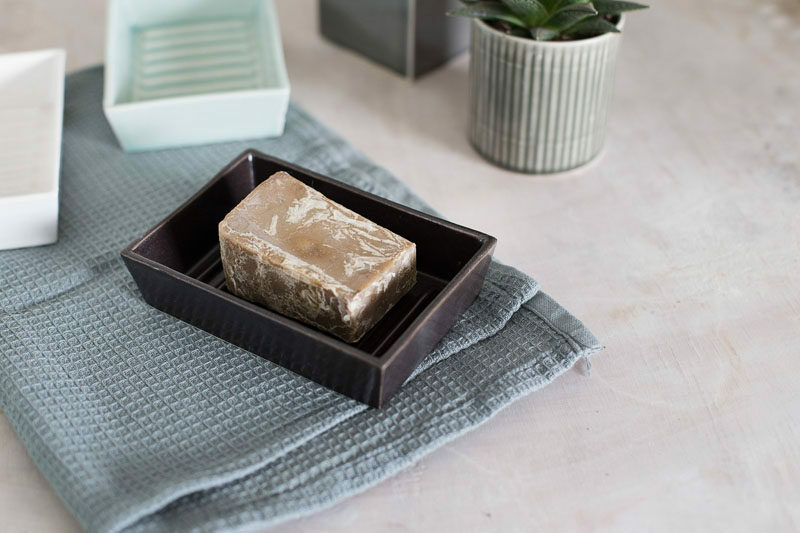 A dark ceramic or concrete soap dish will keep the soaps off the counter, helping to keep it clean and clutter free. Ceramic Soap Dish by 1120 Ceramics Studio. 6. Keep all the shower products organized in style with a wood shower caddy. Decker Shower Caddy designed by Anthony Keeler for Umbra. 7. 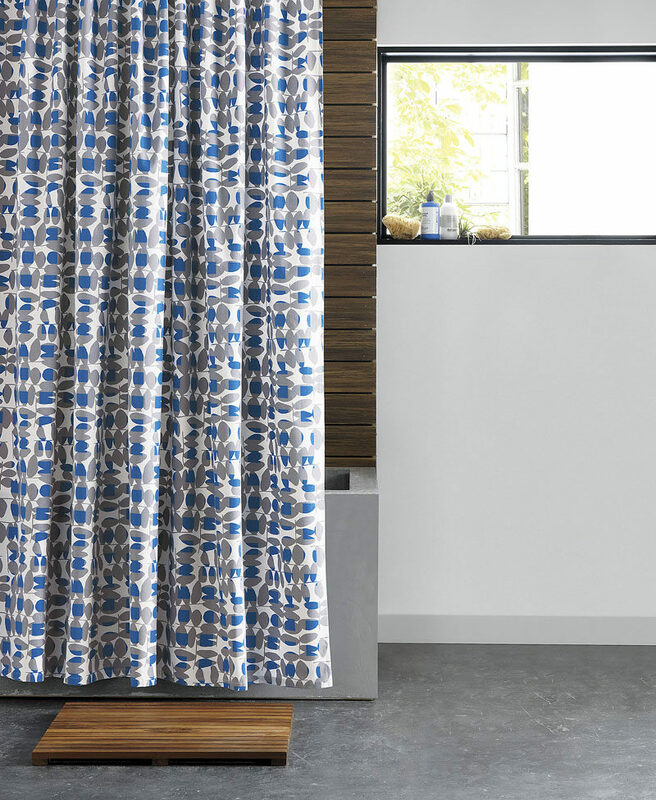 A simple stripe shower curtain is both timeless and gender neutral. 8. 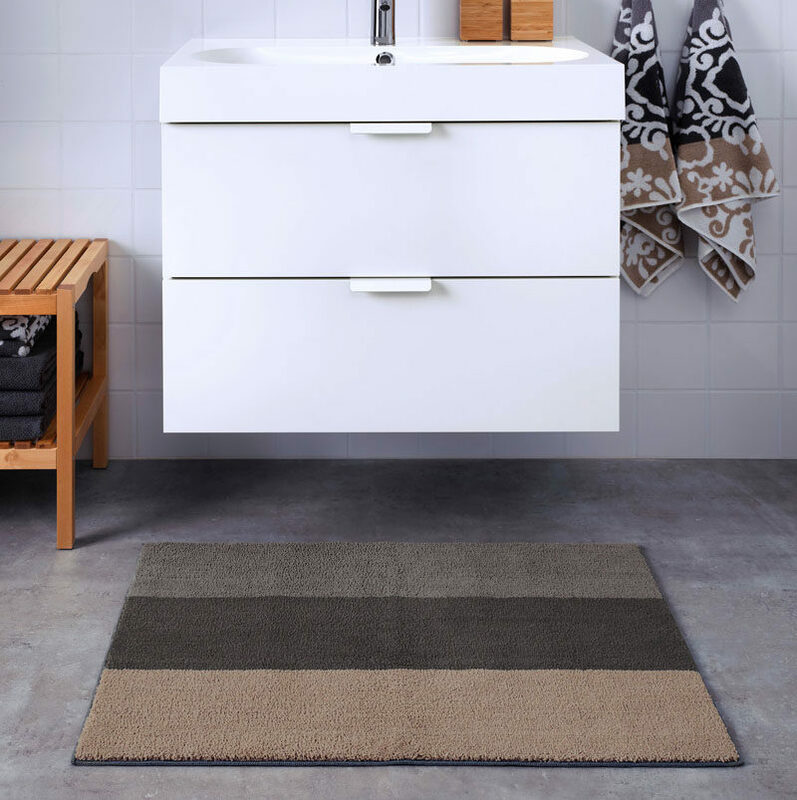 If you’d rather have a soft bathmat instead of a wooden one, this mat with neutral colors is great because it can go with pretty much any masculine color scheme. 9. 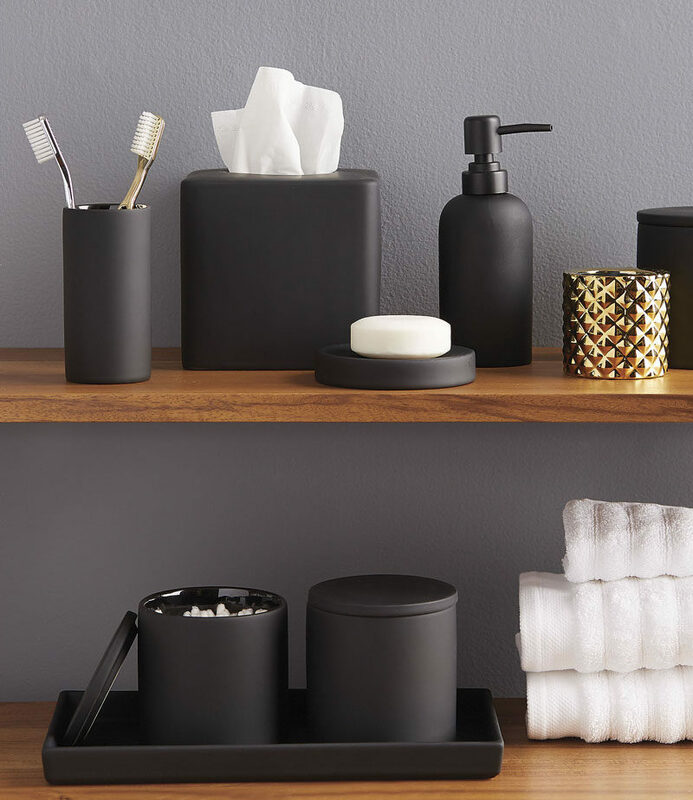 Matte black bathroom accessories add a masculine touch and pack a style punch. 10. 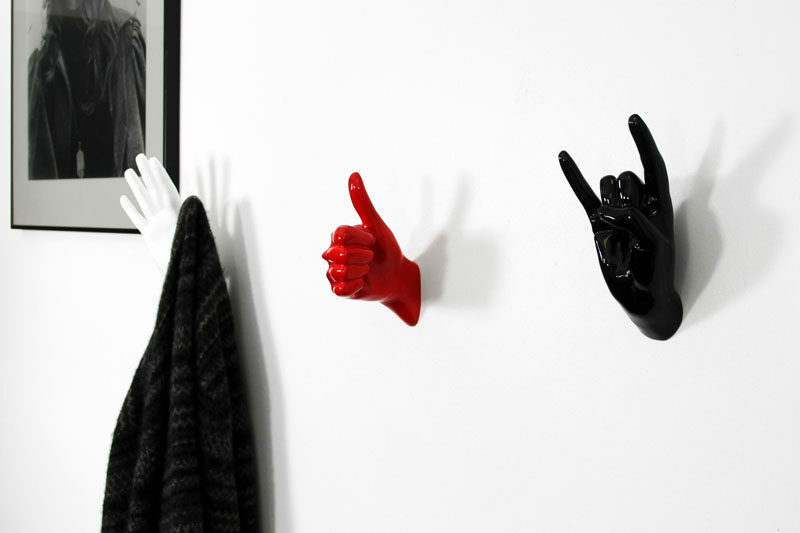 Fun towel hooks can act as both functional elements and a quirky way to inject the bathroom with some personality. Hooks by Thelermont Hupton. Available at made in design. 11. 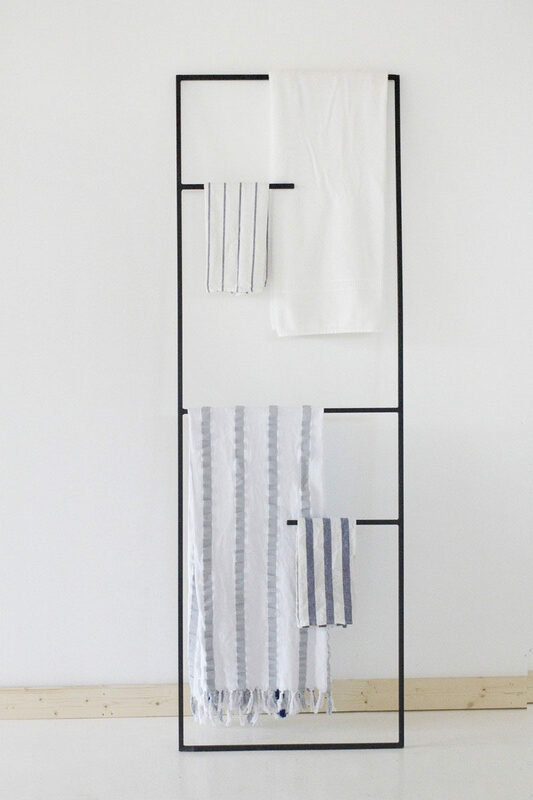 If wall hooks aren’t your thing, you could use a metal leaning ladder instead to display your towels and help them dry faster. The dark metal of this one helps to create a more minimalist masculine feel. Towel Display Ladder by Sonadora In Love. 12. 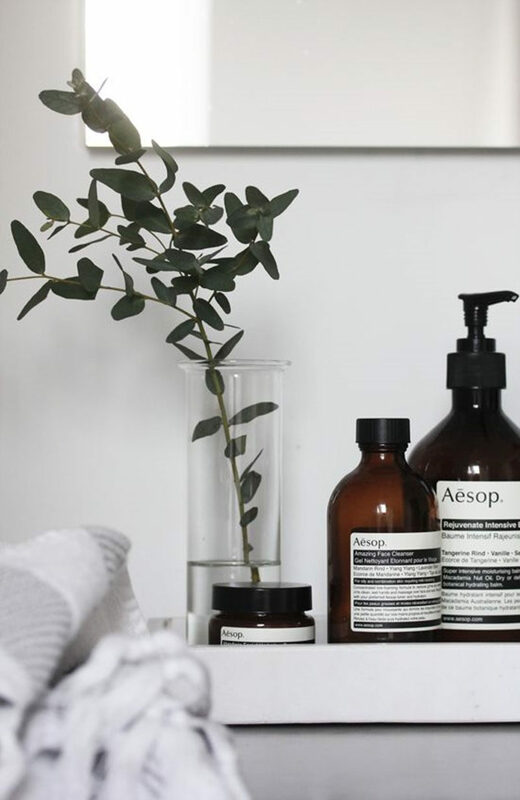 Add a eucalyptus plant to the bathroom. When the steam from a shower combines with the eucalyptus, the whole bathroom smells amazing! Bathroom design and photography by Sarah Sherman Samuel. 13. Framed wall art is another way to add personality to the walls of the bathroom and can double as a reminder of how awesome you are! 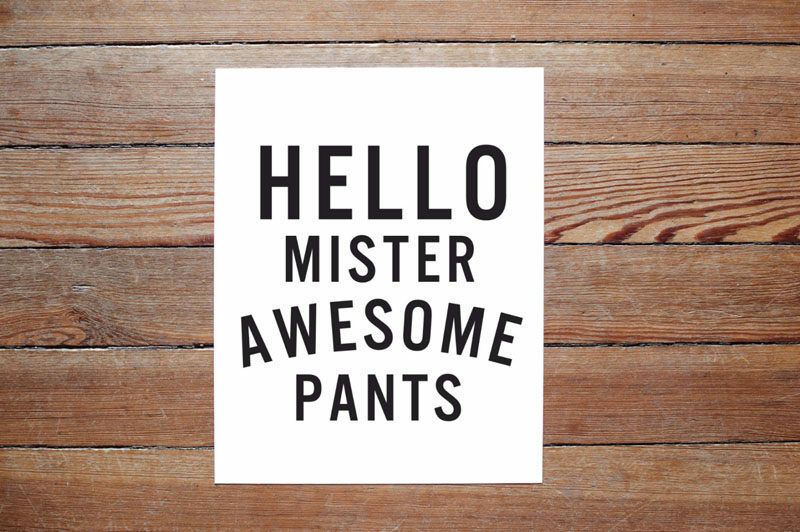 Hello Mister Awesome Pants by Live Love Studio. 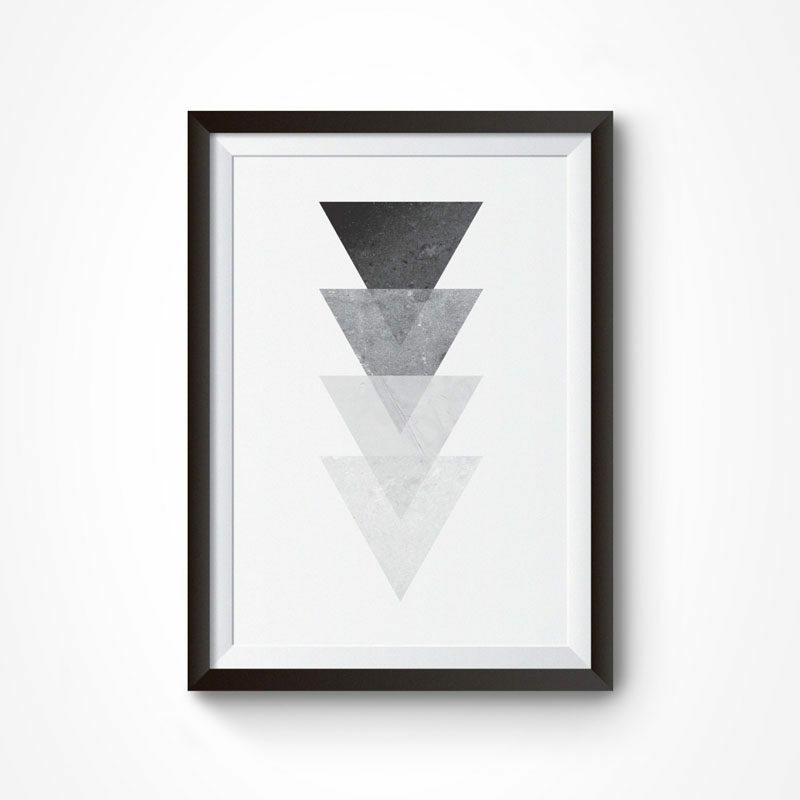 Geometric Wall Print, Black Triangles by Splendiday. 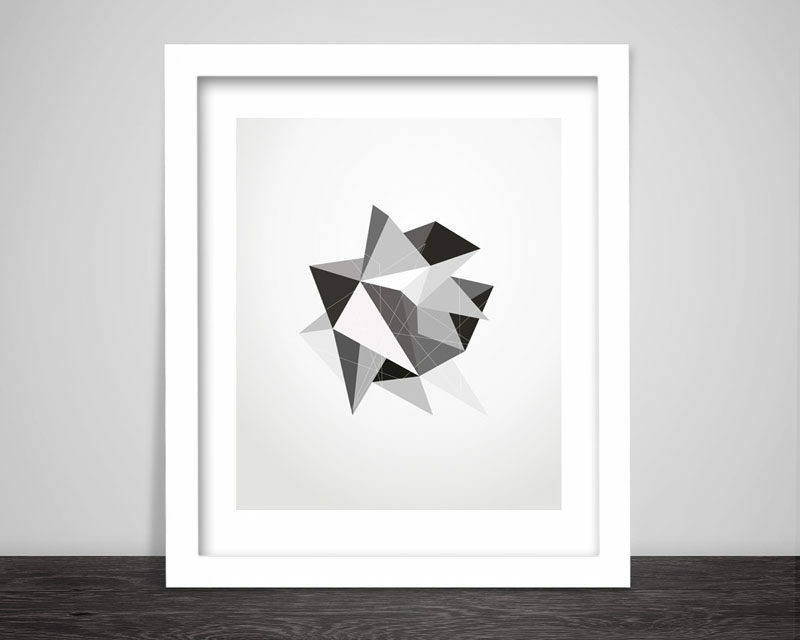 Geometric Triangle Art by Digital Art Printables.